For the crust, in the bowl of a stand mixer, cream the butter and sugar until light and fluffy. Combine the flour blend, xanthan gum & salt, and slowly add to the butter/sugar mixture while the mixer is on low. Mix just until it is combined. Dump the dough into your prepared pan, place a sheet of plastic wrap over the top, and press the dough evenly over the bottom of the pan, building up a 1/2-inch edge on all sides. While the crust is baking, you can prepare the filling. For the filling, whisk together the eggs, sugar, lemon zest, lemon juice, and flour blend. Pour the filling into a large spoon that you are holding about 1-inch above the pre-baked crust. This will stop the crust from eroding away where you are pouring it. Bake for 30-35 minutes, until the filling is set. It is alright if it still has some wiggle when you remove it from the oven, it will set more as it cools. Let cool to room temperature. To remove from pan, cut along 9″ edges, and use the parchment paper to lift the bars out and onto a cutting board. 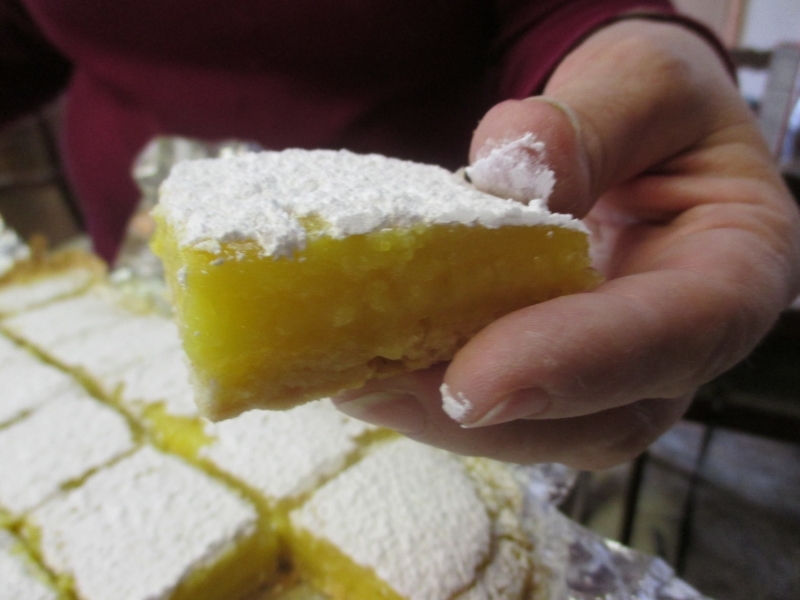 Using a sifter or wire sieve, dust the top of the bars with icing/confectioners’ sugar. Cut into squares, and serve. If you don’t plan to serve them immediately, wait to sprinkle them with the confectioners’ sugar, since it will melt over time.